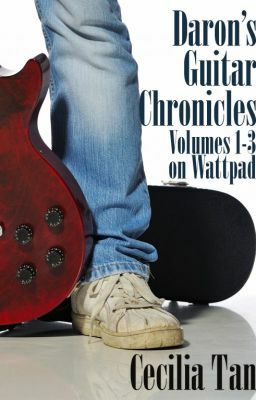 Daron’s Guitar Chronicles tells the story of Daron Marks, a young gay guitar player, from about the time he is eighteen onward. He arrives at RIMCon (Rhode Island Musical Conservatory) in the mid-1980s, desperate to leave behind a dysfunctional family in New Jersey’s suburbs and discover himself. It’s the advent of MTV, AIDS, and punk versus metal, all of which will affect his journey searching for fame, artistic expression, and the courage to seek out the love he needs. Daron struggles with staying in the closet as much as he struggles to get his music heard. Daron’s Guitar Chronicles is a "bildungsroman," which is a fancy word for a novel where the coming of age process is long and gradual. It runs as a twice-a-week web serial at http://daron.ceciliatan.com where there are extras like liner notes, song lyrics, art, fan art, and more. Content Warning The story you are about to read is intended for mature readers due to its sexual content and language. It may not be appropriate for all audiences. Please read at your own discretion.